Our experience has been great. Everyone was welcoming and helpful. All of our questions were answered to satisfy our needs. Dylan was extremely helpful each and every time I visited the dealership. Allowed me to take multiple test drives and was always ready to help even when I dropped by without an appointment. Dylan was thorough in his explanations and provided all information about the car. 10/10 would recommend to friends and family. Dylan was very helpful. At no time did I feel pressured in any manner. He was patient with our questions and any concerns we raised during the purchase procedure. There was no waiting, as my vehicle was taken in right away. The service was completed on time, and work done explained fully. Recommendations were made for my next visit. 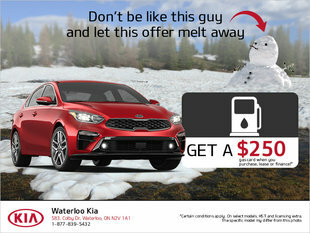 I have serviced both my wife’s and my own vehicle at Waterloo Kia. Dan and Dave are wonderful to deal with and always seem to have my best interests in mind. I will definitely be servicing with them in the future.